« Homepage / Food and Healthy Eating / Recipes / "Creole Tomato"
Finely chop first 4 ingredients then whisk all ingredients together. In a medium saucepan bring about 4 cups of water to a boil. Blanch parsley for 30 seconds, strain and let dry on paper towel. Set aside. In the same saucepan bring oil to a simmer and place basil leaves in oil. Turn off heat, cover and let sit for 20 minutes or until cool. Strain oil. In a blender add parsley and salt; turn on and slowly add oil. Strain with fine chinois. For egg wash: Whisk 2 eggs with 1cup of milk. Mix both cornmeal and corn flour together. Heat oil to 350F. Dip soft shell crabs into seasoned flour and then egg wash and then in cornmeal/corn flour mixture. Cook in oil for 2 minutes on each side. Let sit on paper towel to dry. Assembly: Mix remoulade with jumbo lump crabmeat and stuff into tomato. 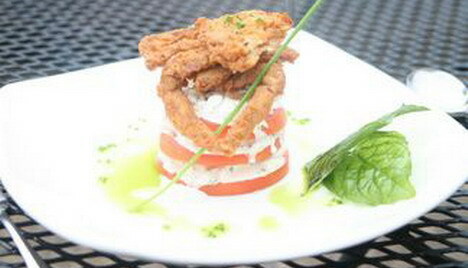 Place soft shell crab around tomato and drizzle with basil oil. Here you can write a comment to the post "Creole Tomato"